Homemade Chewy Peanut Butter Chocolate Chip Granola Bars loaded with oats, wheat germ, peanut butter, swirled peanut butter chocolate chips, and peanuts. 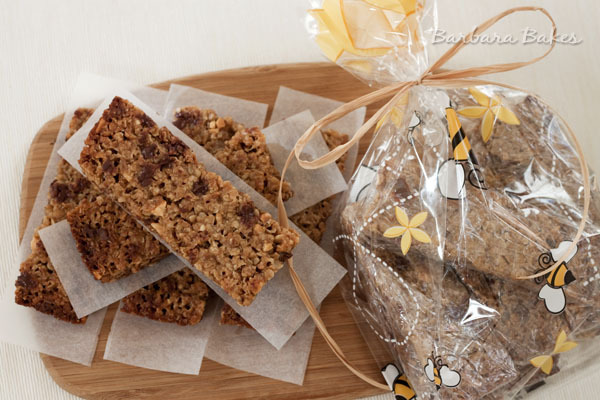 Perfect for a quick breakfast or an on-the-go snack. A friend of mine from Children’s Miracle Network Hospitals, asked me to participate in “May is for Miracles” by posting a favorite recipe I like to take to friends or family during difficult times. Giveaway details are at the bottom of this post. My sweet neighbor was battling cancer and one of my favorite things to bake to take to her was homemade granola. There are endless flavor combinations, you can eat it any time of day and you don’t have to worry about keeping it hot. I decided to change it up and make granola bars this time. My boys favorite granola bars are peanut butter chocolate chip. I Googled peanut butter granola bars and Smitten Kitchen’s post came up. 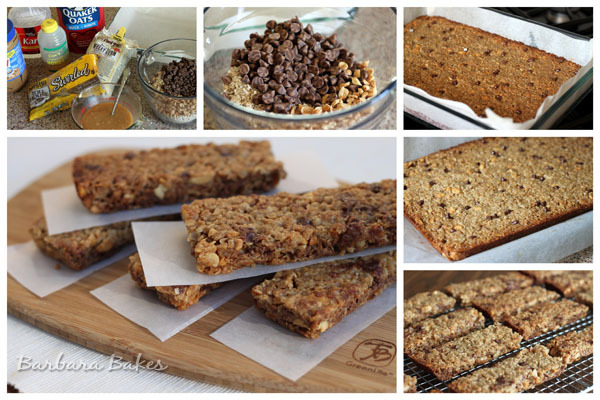 Deb’s recipe was adapted from the King Arthur Flour Chewy Granola Bar recipe. I included some of Deb’s changes, as well as suggestions from other reviewers including reducing the sugar significantly. 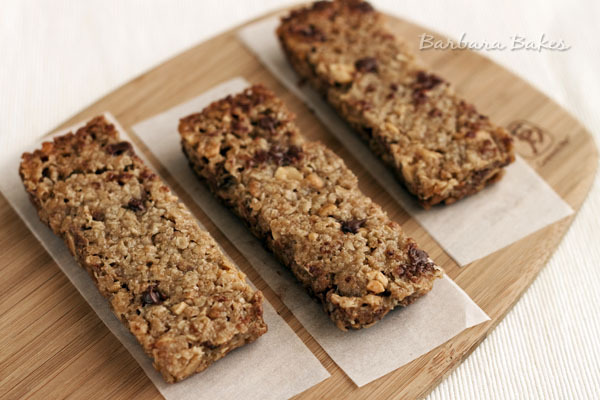 With the peanut butter and chocolate chips these bars are still plenty sweet. Each bar has 7 grams of protein and 3 grams of fiber. 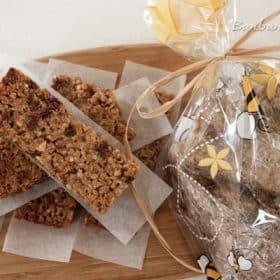 My grandson was in the NICU for a couple of weeks after he was born and I know my daughter appreciated quick, easy to eat items like granola bars that she could take to the hospital with her. I’m sure there’s someone you know that would be happy to receive them too. Preheat the oven to 350°F. Line a 9″ x 13″ pan with parchment. Spray the parchment paper with cooking spray. Mix together oats, wheat germ, salt, cinnamon, chocolate chips and peanuts. In a separate bowl, whisk together sugar, melted butter, honey, corn syrup, peanut butter, water and vanilla. Toss the wet ingredients with the dry until the mixture is evenly crumbly. Spread in prepared pan, use a spatula and gently press mixture evenly in pan. Bake the bars for 25 to 30 minutes, until they’re golden brown around the edges. Carefully remove from pan and cool on a wire rack for one hour. Use a long serrated knife to cut into 4”x1.25” bars. Wrap bars individually to store; or store in layers with parchment in between. In humid weather, it’s best to store bars in the refrigerator. They also freeze well. You can help Children’s Miracle Network Hospitals by supporting fundraising campaigns happening this month at the charity’s partners including Walmart; Sam’s Club; Rite Aid; Costco; and Chico’s FAS Brands: Chico’s, White House Black Market, Soma Intimates and Boston Proper. For more May happenings: www.MayIsForMiracles.org. Children’s Miracle Network Hospitals raise funds for 170 children’s hospitals (Primary Children’s Medical Center is our Utah hospital). Update: The giveaway is now closed. Congratulations Kathia! Having fun shopping! To enter leave a comment on this post before Friday, May 18 at noon, MST, and tell me what you like to take to friends or family during difficult times.